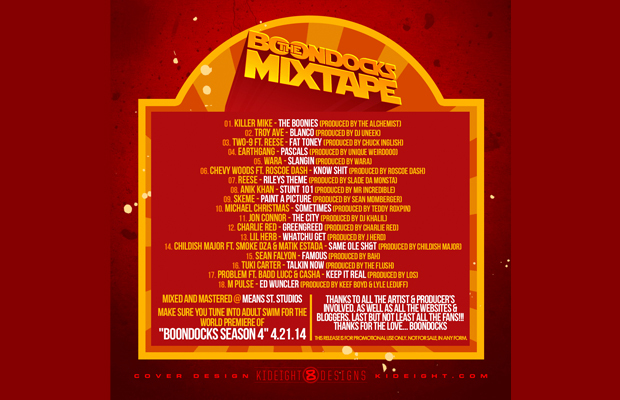 In support of the new season of The Boondocks premiering next week, the show has put together a new mixtape. Hosted by DJ Drama, Don Cannon, and the Aphiliates, this tape carries 18 tracks with appearances and production from Lil' Herb, Alchemist, Reese, Problem, Troy Ave, Chuck Inglish, and more. the season 4 premiere of The Boondocks is set to air on Monday, April 21 at 10:30 p.m. EST on Adult Swim. Check out the tracklist, stream and/or download this mixtape below.